Another year and another amazing season for the Hospital Thrift Shop. After an incredible five months of sales on India Street in downtown Nantucket, the Hospital Thrift Shop on Monday announced a $327,000 gift to Nantucket Cottage Hospital. This year’s gift has been earmarked for distinct purposes, including $177,000 for cardiac stress testing and telemedicine equipment, as well as $150,000 that will be set aside for the capital campaign for the new Nantucket Cottage Hospital. The Thrift Shop has now raised $300,000 toward its original pledge of $500,000 for the new hospital. “We had a great year and we’re just so happy to be able to help the hospital with its current needs, and its needs in the future,” said Cathy Ward, President of the Thrift Shop’s Board of Directors. 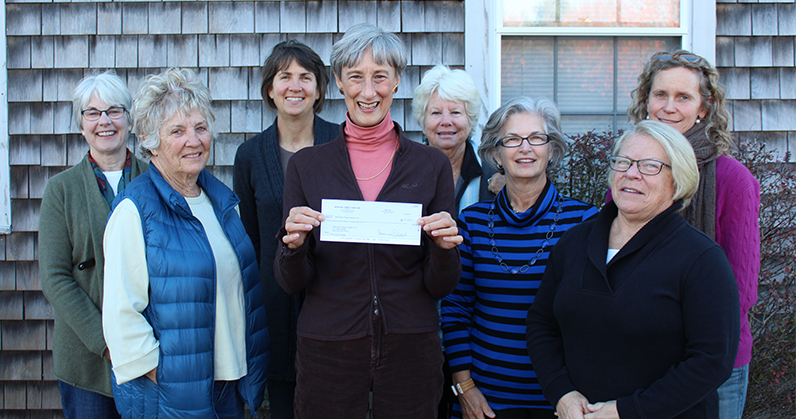 Ward, along with the other Thrift Shop board members, recently presented a check to Nantucket Cottage Hospital President and CEO Dr. Margot Hartmann, a tradition that now stretches back nearly nine decades. The Hospital Thrift Shop sells merchandise donated by island residents and visitors – anything from books to furniture to artwork – from late May through mid-October, and operates as a separate non-profit organization. 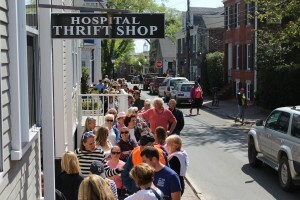 In addition to the generous donations from island residents, the Hospital Thrift Shop’s great season can also be attributed to the extraordinary donations of a range of new, unused merchandise and clothing from The Nantucket Brand, the Nantucket Emporium, Nantucket Gourmet, the Nantucket Hotel, the Brass Lantern Inn, and the Blue Beetle, among others. The Thrift Shop was founded in 1929 when a group of dedicated volunteers came together to provide affordable clothes and household goods to the island community. Its first gift to the hospital that year was $603. Since that first donation, the Thrift Shop has contributed more than $4 million to the hospital during its 86 years of operation, a legacy of generosity that has benefited NCH in many ways, from new radiology and lab equipment, to a remodeled dialysis unit and new primary care offices, as well as furnishings for patient rooms. How fabulous! The Hospital Thrift Shop has always been so supportive of NCH and its’ endeavors. Kudos the Thrift Shop Board and all of their volunteers for a banner season. Hope my stuff helped!